WRIGHT, ORVILLE. (1871‑1948). American inventor and aviation pioneer who, with his brother Wilbur, completed the first sustained and piloted flight of a heavier-than-air machine. TLS. 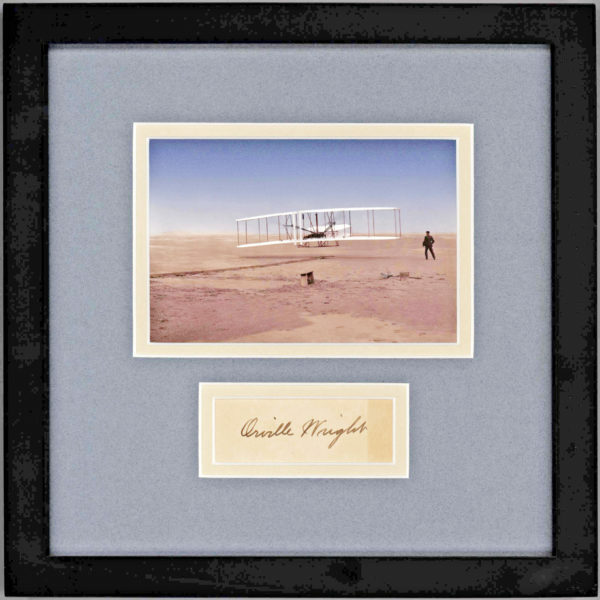 (“Orville Wright”). 1p. 4to. Dayton, November 10, 1921. To L.D. Gardner of Gardner, Moffat Company, publisher of the Aviation and Aircraft Journal from 1919 to 1921. After their first successful flight in a motor-powered airplane on December 17, 1903, the Wright brothers continued their aviation experiments and received a U.S. patent for a flying machine in 1906. American interest in the airplane developed slowly, but the brothers were soon negotiating with the French and British governments for the production of airplanes. However, legal matters dominated the discussions because of widespread cases of patent infringement. 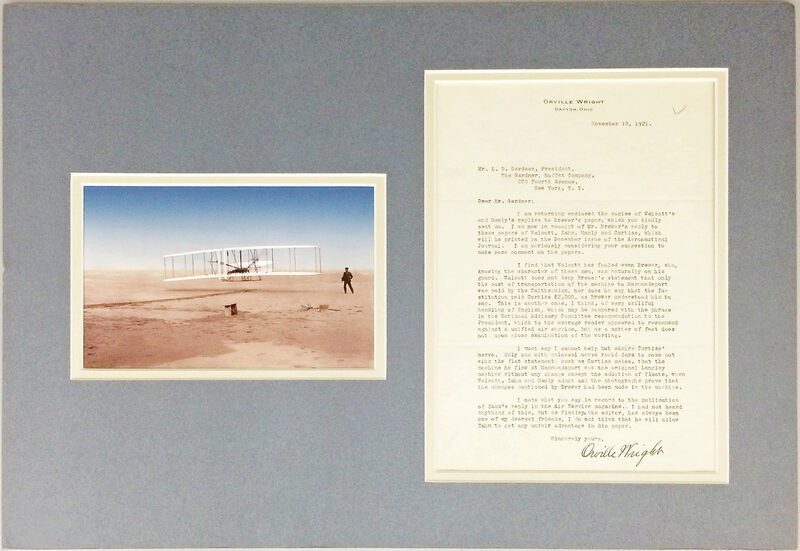 Notably, Orville refused to lend the 1903 craft to the Smithsonian because of a claim that a secretary of the institute had invented a machine capable of flight before the Wright brothers. Charles Manly (1876-1927), mentioned in our letter, was an American engineer who, with Smithsonian Secretary Samuel P. Langley, built “the Great Aerodrome.” The aircraft was piloted twice by Manly in 1903 but was a failure. One of the Wrights’ enemies in their patent war was aviation pioneer, aircraft manufacturer and father of U.S. naval aviation Glenn H. Curtiss (1878-1930). Curtiss started his career as a lowly Western Union bicycle messenger who, like the Wrights, eventually owned his own bicycle shop before his interests turned to motorcycles and aviation. He supplied engines for the first successful dirigible in the country, and so impressed Alexander Graham Bell that he earned an invitation to his Aerial Experiment Association. The A.E.A. produced several aircraft including the June Bug, or Aerodrome #3, which Curtiss famously test piloted at Hammondsport, New York, winning the Scientific American Trophy in 1908. 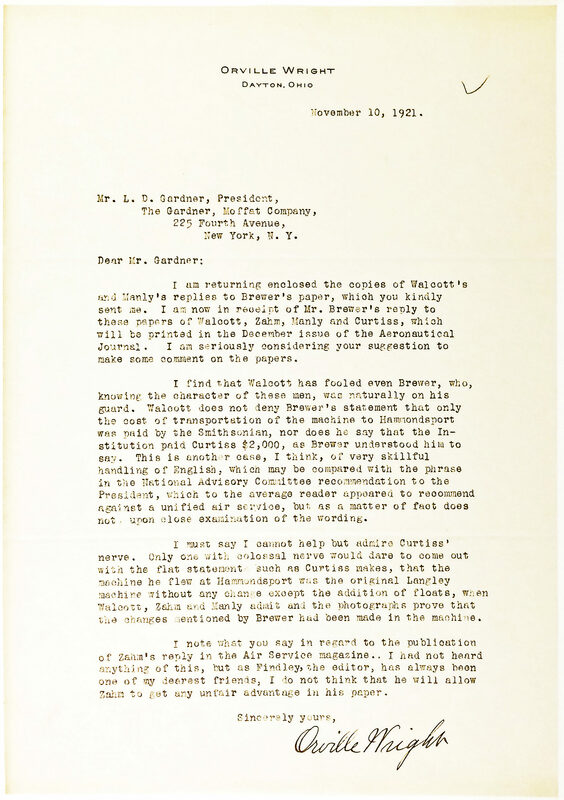 In our letter, Wright takes issue with Curtiss’ claims about the similarity of the June Bug to Langley’s Great Aerodrome. Among Curtiss’ other historic “firsts” were his receipt of the Aero Club of America’s U.S. Pilot’s license No.1 (the Wrights were Nos. 4 and 5) and flying the first long distance flight (between Albany and New York). Prior to and during World War I, Curtiss worked with the military to train aviators and designed and manufactured some of the navy’s first aircraft. Between 1910 and 1914, the Wrights initiated a series of lawsuits against Curtiss at which Albert Francis Zahm (1862-1954), a professor of physics and the chief of the Aeronautical Division of the Library of Congress, testified as an expert witness. Our letter discusses the forthcoming publication in The Aeronautical Journal (Vol. XXV, No. 132. December, 1921) of Griffith Brewer’s [1867-1948] article, “Langley Machine & Hammondsport Trials,” that included responses by Charles D. Walcott, Smithsonian Institution, A.F. Zahm, C.M. Manly, Glenn H. Curtiss. Brewer was an English aviator and balloonist and the first Englishman to fly with Wilbur Wright, after meeting him in 1908. He was a close friend and supporter of the Wrights, visiting them often in the United States. 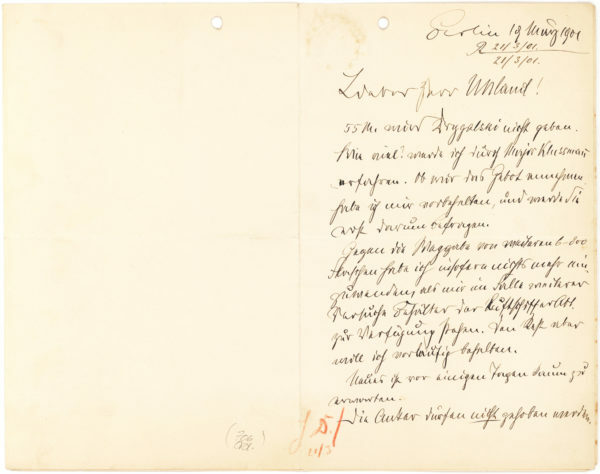 It was Brewer who arranged for the British government to purchase the Wrights’ patents in 1914. Charles Doolittle Walcott (1850-1927) was a paleontologist best known for his discovery of fossils in the Burgess Shale. He was the secretary of the Smithsonian beginning in 1907, and went on to serve as president of the American Association for the Advancement of Science as well as becoming an advisor to President Theodore Roosevelt. Lightly folded with two small pin holes in the top margin. Boldly signed an in excellent condition. Matted with a colorized photo of the historic flight at Kitty Hawk.